The Advanced Research Projects Agency – Energy (ARPA-E) of the U.S. Department of Energy is challenging the research and industrial communities to discover, develop, and test innovative and disruptive Control Co-Design solutions for critical wind energy challenges. 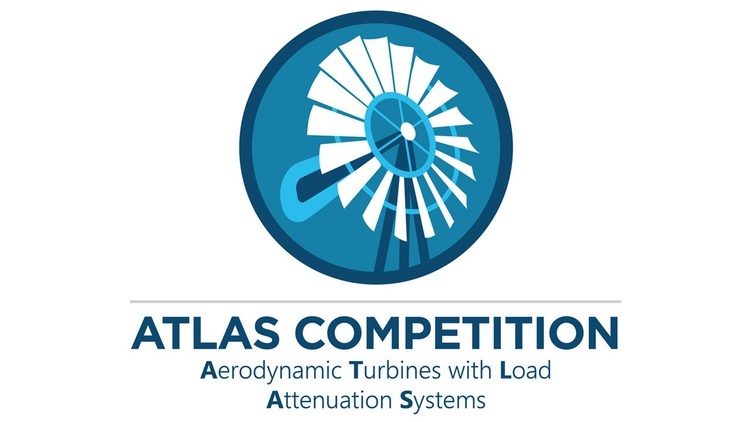 The ATLAS (Aerodynamic Turbines with Load Attenuation Systems) Competition is the first ARPA-E effort associated with this advanced design methodology. The competition seeks to design individual and collective pitch control systems for large floating offshore wind turbines (Offshore Challenge) affected by asymmetric and unpredictable wind and wave fields. An additional land-based wind turbine case (Onshore Challenge) is also proposed as a simpler case and a potential training step in the process. In both Challenges, the primary objective is to reduce the mechanical fatigue of the main system components without compromising the Annual Energy Production (AEP). Leveraging algorithms that are successful, future designers would be able to propose more reliable, more resilient and more optimal turbine designs, reducing the associated Levelized Cost Of Energy (LCOE) of the wind turbine. Collective pitch control (CPC) regulates the rotor speed (Wr) of wind turbines when the turbine is experiencing wind conditions above the rated speeds –i.e., with wind velocities typically above 11 m/s. CPC changes the pitch angle of the three blades (b1, b2, b3) identically and simultaneously to regulate the rotor speed under variable wind –see Fig.1. CPC is the common solution applied in commercial multi-megawatt turbines. However, CPC does not consider the asymmetry of the wind velocity profile over the rotor area, which could introduce large unbalanced loads in the system. Individual pitch control (IPC) is an innovative technique that considers these wind asymmetries. It has the potential to reduce the associated asymmetric mechanical loads on the blades, minimizing the mechanical fatigue of the structure (nacelle, tower, floating platform, mooring system, etc.) without significantly compromising the average of power generation. In addition to the CPC signal (bcpc), the IPC adds to each pitch motor an individual control signal (bipc1, bicp2, bipc3) to reduce the asymmetric loads. Calculations of these individual control signals can be based on the information provided by sensors that measure directly or indirectly the bending moments of each blade (M1, M2, M3), the rotor azimuth (f), and advanced control algorithms –see Fig.1. Fig.1. 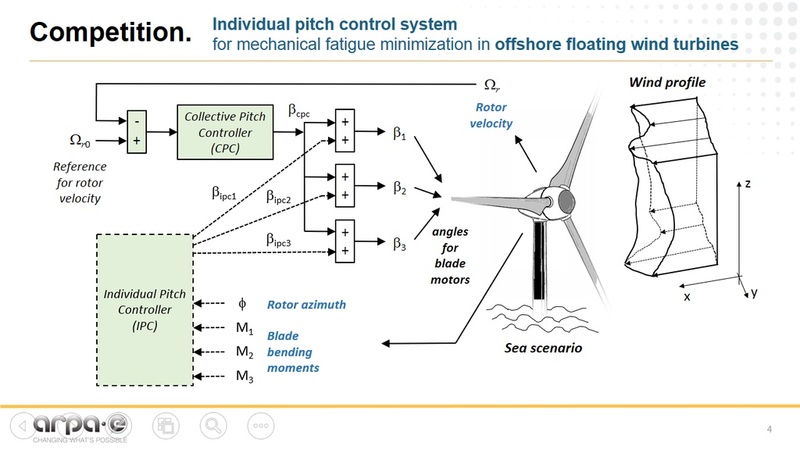 Individual and collective pitch control systems for floating offshore wind turbines affected by asymmetric and unpredictable wind and waves (Offshore Challenge). Figure 2 exemplifies a general methodology to design wind turbines. The figure includes a representation of the sub-systems of a floating offshore wind turbine: rotor, drive-train, electrical generator, power electronics, substation, nacelle, tower, platform, mooring system, aerodynamics, hydrodynamics, and grid and control systems. It also shows the inputs: wind, waves, grid voltage and frequency, etc. The figure emphasizes the multiple sub-system interactions. Fig.2. General wind turbine design process and the ATLAS competition (red-shaded area). Control Co-Design is a powerful methodology to find optimal designs when significant sub-system interactions are present. It uses control principles, co-optimization techniques and co-simulation methods, starting at the very beginning of the design process. ARPA-E has recently released (1) a Request for Information, (2) a Teaming Partner List, and (3) plans to organize an Industry Day on January 15th, 2019, for a possible future program on Control Co-Design of Floating Offshore Wind Turbines. 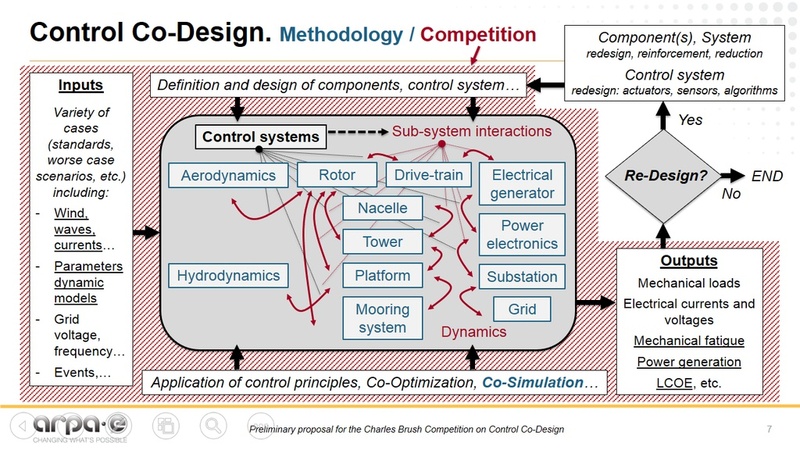 The ATLAS Competition is designed to immerse participants in the earlier part of this iterative control co-design process, as shown in the red-shaded area of Fig. 2. It encompasses the first part of the iteration, with the design of an innovative control solution (IPC+CPC) and the simulation of the system dynamics (wind turbine) under a variety of input scenarios (wind profiles, waves and parametric uncertainty). The scope of the ATLAS Competition covers the process until just before the re-design diamond block. It includes only the design of the IPC+CPC control solution to reduce the mechanical fatigue of the main components of the wind turbine under a variety of wind and wave conditions. 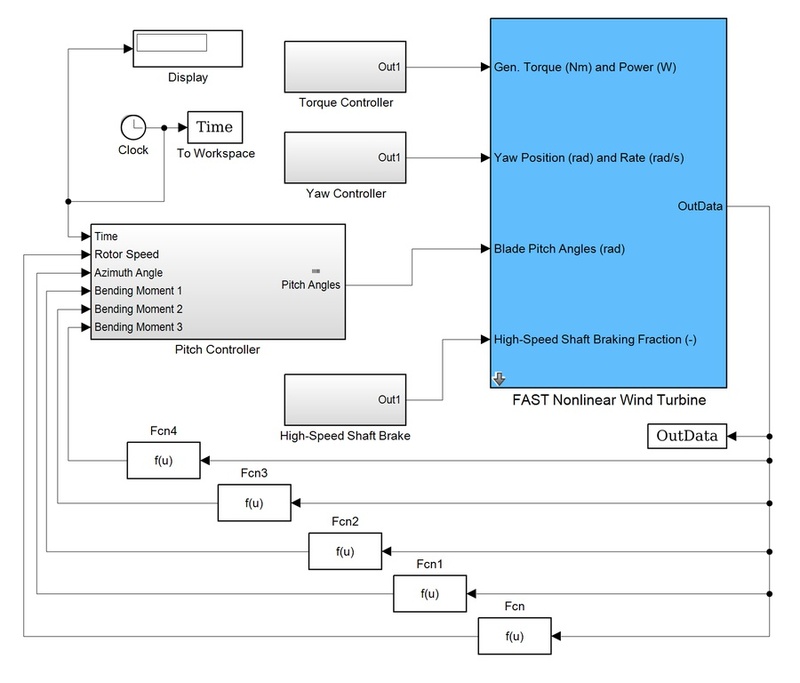 The land-based wind turbine (Onshore Challenge) and floating offshore wind turbine (Offshore Challenge) simulations of the ATLAS Competition will be performed using the OpenFAST computer program developed by the National Renewable Energy Laboratory (NREL) –see Fig.3. The participants will have access to OpenFAST, the wind turbines models and a set of inputs (Set A) that includes a variety of 3D wind velocity profiles and parameters. The Offshore Challenge also includes sea conditions (waves). The evaluation of the competition will run a super set of inputs (Set B) that includes Set A and other additional scenarios defined for the same wind class and sea state. The competition participants will submit the control algorithms as a Simulink block with associated m-files or p-files –see IPC and CPC block in Fig.1 and Pitch Controller block in Fig.4 (note that all the units are in the metric system). Each participant must also submit a report explaining the uniqueness of the technological approach applied to develop the underlying algorithms. The report must not exceed four pages and can contain the level of detail chosen by the participant. The report is necessary to participate in the competition. However, evaluation and scoring will be based solely on the performance of the control solution across all the simulated cases (Set B). Fig.3. OpenFAST computer program (NREL). 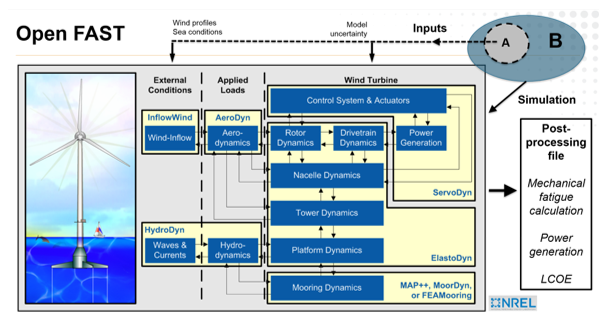 In both Challenges, the control solutions will be applied to the well-known and well-characterized NREL 5MW reference wind turbine, and will be tested with the OpenFAST simulator under non-homogeneous 3D wind profiles and different wind turbine cases within the model parametric uncertainty, as well as additional sea scenarios in the Offshore Challenge. Every practical design of a wind turbine uses a limited number of cases to understand the very large number of potential scenarios that the real-world system contains. In the same way, a subset (Set A) of the superset (Set B) in Fig.3 will be provided to participants. Boundary conditions for Set B will be shared. The competition will evaluate the reduction of tilt/pitch and yaw loads over the structures and flap-wise loads over the blades, all without compromising the average power generation. Fig.4. Simulink block diagram. Participants of the ATLAS Competition will design and submit the Pitch Controller block (CPC+IPC). All the units are expressed in the metric system. Jonkman, J. (2015). “FAST | NWTC Information Portal.” Retrieved from https://nwtc.nrel.gov/FAST. Wheeler L. and Garcia-Sanz M. (2017). “Wind turbine collective and individual pitch control using quantitative feedback theory”. ASME 2017 Dynamic Systems and Control Conference, Tysons Corner, Virginia, USA.